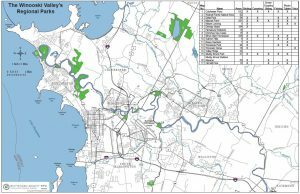 The Winooski Valley Park District owns and manages 18 parks and natural areas consisting of over 1,750 acres of conserved land, 25 miles of trails, and protects 13 miles of shoreline along lakes, rivers, and ponds in the Winooski River Valley. Parks are open to the public free of charge year-round from dawn to dusk each day. The WVPD’s parks enhance the scenic beauty of its seven member communities and offer opportunities for outdoor recreation close to where people live and work. The parks provide nature trails, scenic overlooks, picnic facilities, cross country skiing trails, canoe and kayak launches, fishing access, and public garden plots. The WVPD’s parks provide residents the opportunity to experience the natural environment with minimal human disturbance. For trail maps and further descriptions click on the desired park. An 182-acre pond and surrounding forest situated within a large tract of contiguous forest. Colchester Pond offers a 3.5-mile walking trail through forest and fields that circles the pond, canoe and kayak access, fishing, picnic areas and wildlife viewing. A favorite spot to visit year-round! A 55-acre park at the mouth of the Winooski River encompassing several diverse ecosystems and a half mile of natural sandy beaches. 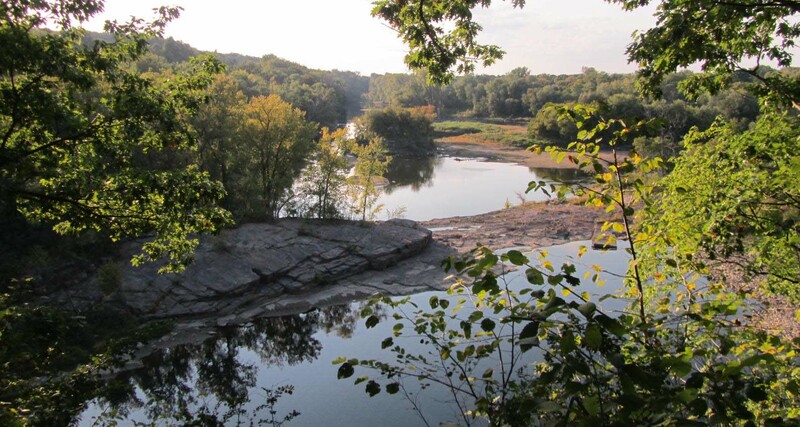 A 148-acre nature preserve along the Winooski River with a variety of floodplain ecosystems. A 15-acre park covered by cattail marsh, featuring ancient limestone dolomite caves. Seasonal picnic area off of Rt. 15 with shade trees and picnic tables. A 284-acre park along the Winooski River in Burlington featuring numerous wildlife species, an elevated boardwalk through a cattail marsh, and several miles of trails along the river and through floodplain forests. Visit the Ethan Allen Homestead Museum to tour Ethan and Fanny Allen’s restored 1787 farmhouse. The park is also home to various community gardens and the Winooski Valley Park District offices. Undeveloped 12 acres of conserved wetland and floodplain forest along the Winooski River. A 288-acre park with floodplains, meadows, and upland hardwood forests offering hiking and cross country trails. A quiet spot near the mouth of the Winooski River, next to the Burlington Bike Path, featuring a grassy area with picnic tables surrounded by shade trees. A 27.5-acre park in South Burlington featuring several diverse ecosystems, including Winooski River frontage, and a 1.75-mile loop trail. A 48-acre park with constructed and natural wetlands, offering hiking and cross-country ski trails. Formerly a beaver pond, Old Mill Park is now an open meadow landscape in Jericho with Clay Brook running through the middle. Enjoy a hike through the white pine dominated forest with views of the Clay Brook along the way. Salmon Hole Park lies at the bottom of the Winooski River Falls on the Burlington-Winooski border. Riverwalk Trail follows the Winooski River for about a 1/2 mile to Riverwalk Park on Intervale Road. Currently undeveloped 18-acre natural area with riparian forest along the Winooski River. Winooski Gorge is an 11-acre natural area in South Burlington featuring a deep river gorge and a Limestone Bluff Cedar-Pine Forest. Generously donated by the Wolcott Family in 2012, the Wolcott Family Natural Area is a 61.7-acre park featuring a variety of habitats, including marshes and riparian areas along Pond Brook, that flows from Colchester Pond. The park is being developed to have a 1-mile loop trail and accompanying viewing areas to provide educational and passive recreational opportunities. Woodside Natural Area consists of a diversity of habitats, with forest and beaver-impacted wetlands at its center. Enjoy a 1.5-mile loop trail that offers views of the Winooski River and wetlands.